DIR-865L Amplifi Cloud Router 5700 is from D-Link with SPI firewall, easy media sharing features, 2.4GHz Wireless N, etc.. DIR-865L Amplifi Cloud Router 5700 supports WPA2, strong wireless protection against intruders. It has 4 LAN ports, one USB port (which can be connected to a flash drive and share content among all devices in the network), one Internet port, reset port and power button. You need to press the WPS button to start the WPS in DIR-865L Amplifi Cloud Router. In this tutorial, we can check the methods to configure D-Link DIR-865L Amplifi Cloud Router 5700 with DSL broadband and Cable Internet connection. If you have seen any drop in Internet speed after connecting DIR-865L Amplifi Cloud on your existing network, you can follow the instructions provided in the link below to improve the Internet connection speed. 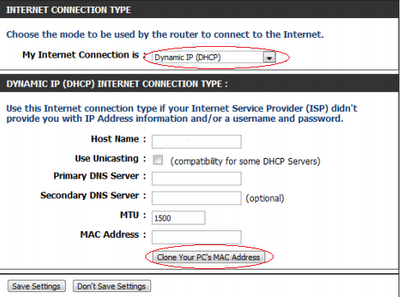 To access and setup D-Link DIR-865L Amplifi Cloud Router 5700 in your existing network, follow the steps below. 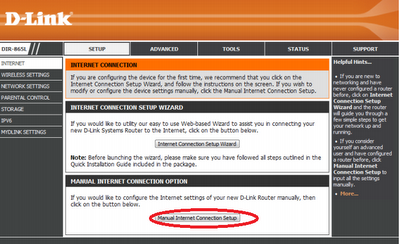 Click on Manual Internet Connection Setup to configure DIR-865L Amplifi Cloud Router with DSL modem or Cable Modem manually. Now select the Internet Connection type from the drop-down menu provided in the setup page. If you have a cable Internet connection, you must configure it with the option Dynamic IP. You need to clone your PC's MAC address to validate the connection between router and cable modem. Please note that you have to clone the MAC address of the computer which you used at the time when you configured the cable modem. It is because that specific MAC address is registered with your cable broadband ISP. Select Dynamic IP(DHCP) from the drop-down menu to configure D-Link DIR-865L Amplifi Cloud Router 5700 with your cable Internet connection. After this step, you can share Internet from your cable modem among multiple computers connected to D-Link DIR-865L Amplifi Cloud wireless Router 5700. While configuring it With DSL modem, you must ensure that the third octet of the router IP address is not same as the 3rd octet of DSL modem IP address. For example, the modem IP address can be anything 192.168.X.1, where X cannot be 0. 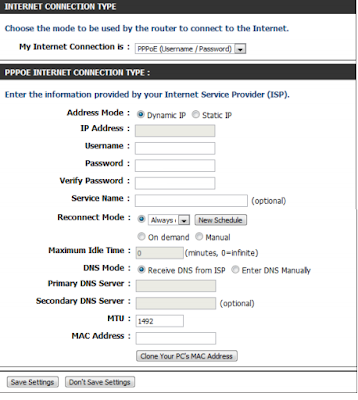 Select the option PPPoE (Username/Password) from My Internet Connection drop-down menu. Enter the details supplied by your Internet Service Provider such as username, password, etc..
Now we have successfully configured Internet connection on D-Link DIR-865L Amplifi Cloud Router 5700 with the ISP. 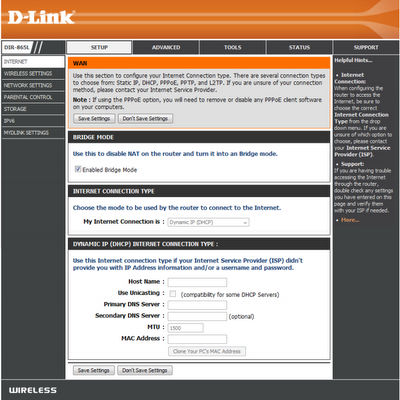 To learn more about how to configure a D-Link router manually with cable and DSL broadband connection click on the link below. In this article, we have learned how to configure D-Link DIR-865L Amplifi Cloud Router 5700 with both cable Internet connection and DSL Internet connection. Now let us check how to configure the modem with one of the leading broadband service provider(DSL connection). To learn more about it click on the link below.